Shar-Pei puppies open their eyes anywhere from about 10 days to as late as 3 weeks. 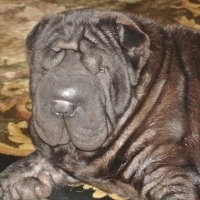 If Shar-Pei puppies' eyes need to be tacked it is done at 3 weeks. Most of mine do not need any tacking. Eye tacking is the technique of placing temporary holding stitches that hold excess skin off the eye. This can happen when puppies put on loose skin too quickly before their heads grow into it. it is simply a few holding stitches aboe and below each eye to lift the skin off the eye while the head is growing into some of the skin. They usually are left in 2-3 weeks. Sometimes the eyelids can develop a tendency to roll under. Entropion eye surgery is when some of the skin is actually removed to keep the lashes from turning in and rubbing the eye. Most of my Shar-Pei never need this procedure, but when you buy a Shar-Pei it is always a possibility. The eyes can have some discharge especially in the spring and summer months when the pollen counts are high. You can use benadryl and also some allergy eye drops (people kind).